Episode 16: "Patron of the Arts"
In Brussels, Belgium, artist Paul Breton negotiates the sale of one of his paintings with well-known art dealer Francois Duval, who pays him a fraction of Breton’s asking price. Andre Morat, Duval's assistant, notes that the painting will be worth much more in the sad event that Breton passes away. Visiting a Brussels art museum (presumably the Royal Museum of Fine Arts), Charlie Chan and Number One Son, Barry overhear Paul and Monica Breton as they discuss their financial difficulties. Chan offers the artist and his wife a "sumptuous dinner" in exchange for a guided tour of the museum’s collection. Andre Morat visits Renaud, the owner of a large gambling house. As Morat owes Renaud a large sum of money, he tells the gambling house owner about the potential value of the paintings of Paul Breton should Renaud purchase the artist's paintings at a low price and then do away with him, thus reaping the benefit of his demise. Angered by this proposal, Renaud sends Morat away with the warning that it is he who will end up dead if he does not repay his debt soon. After their dinner together, Chan and Barry share the hospitality of the Bretons at their modest home. Also paying a visit is Renault who is very interested in purchasing two of the artist's paintings. Chan is suspicious of his motives, noting the gambling house owner's reaction upon seeing the detective at the Breton's home. Later that night at Breton's studio, a shadowy figure, while stealing one of the artist's paintings, shoots the person who has spotted him. At his gallery the next day, Duval offers to buy a number of Paul's paintings at a low price, but Breton refuses. The artist says that he will not sell for anything less than 10,000 francs. As Duval balks, Chan offers to pay that amount, to which the art dealer grudgingly matches. 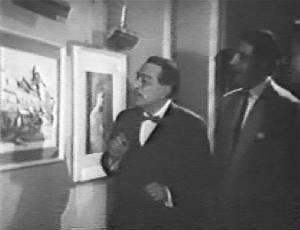 Later, Chan, with Barry, visits Renaud asking if he can view his art collection, noting that one is by the late Pietro Bordini as well as one by Paul Breton. Chan asks Renaud if he purchased Breton's painting in the hope of his eventual demise that would result in a sudden increase in value. As the Chans prepare to leave Renaud's establishment in Barry's car, Chan discovers an explosive device that had been connected to the car’s ignition. Later, at Breton's home, the detective hears of the artist's similar brush with death at a bus stop when someone in the crowd tried to push him under the approaching bus. Chan is now prompted to call on his old friend Inspector Bonnet, inquiring into the suspicious suicide of the late Pietro Bordini, noting Paul Breton’s near fatal "accident" that morning. The next day, Andre Morat has set a trap for the artist at Renaud's office. Forcing Renaud to call Paul, requesting a meeting at his office, Andre is set to shoot the artist with Renaud's gun, thus framing him for the murder. However, as Renaud makes a move to grab the gun, Andre shoots him, just before the artist arrives. As Breton enters the office, Andre prepares to kill him, but Charlie Chan bursts in just in time, shooting and wounding him. Chan, Barry, and Paul soon arrive at Duval's gallery surprising the art dealer who was obviously expecting to see Andre. Chan tells Duval that Andre has told him everything. As Duval claims his innocence in the killings of Renaud and Pietro Bondini, Chan asks him how it is that he knows that both men were murdered. Trying to escape, Duval is grabbed by the police, accompanied by Inspector Bonnet. 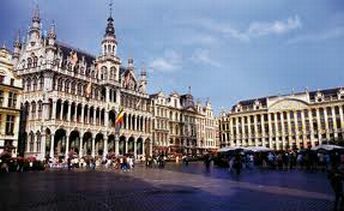 The museum visited by Charlie and Barry Chan was probably the Royal Museum of Fine Arts of Belgium (seen above). Barry Chan (in reference to the 10,000 francs paid for a painting by Paul Breton): "Pop, that's about 200 bucks." In contemplation of eternal beauty, one catches glimpse of eternal truth. Arrival of good fortune is like return of long-delayed ship - one hardly dares think it is not a mirage. A sheepherder is always suspicious of strange sheep, because, under sheepskin might be wolf. In digging up tree, one must start with roots. Man's tongue loosens when justice apprehends him. Truth will come to light, murder cannot be long hid.